﻿ How to Test if your Stainless Steel is Grade 304 or 316 Wire - Anping County Zhuoda Hardware Mesh Co., Ltd.
Generally speaking, it is not possible to determine the composition of a stainless steel by simple visual inspection, although colour can be a guide to separating austenitic grades (300 series) which have a yellow tinge, and ferritic grades (400 series) which have a blue metallic tinge). So, how do you know what your sample is? Or how do you know that you are getting what you ordered? Firstly, the mill which produces our stainless steel wire and mesh is required to provide a certificate which shows the chemical composition. An example Mill Certificate is shown below. As part of our quality control, at Stainless Steel Wire and Mesh we use a Niton XL2 analyser to confirm the composition. This instrument is a non-destructive tester which has a 98.7% alloy grade identification accuracy. The Niton XL2 analyser gives us the ability to test and identify customer’s samples when required for ordering. 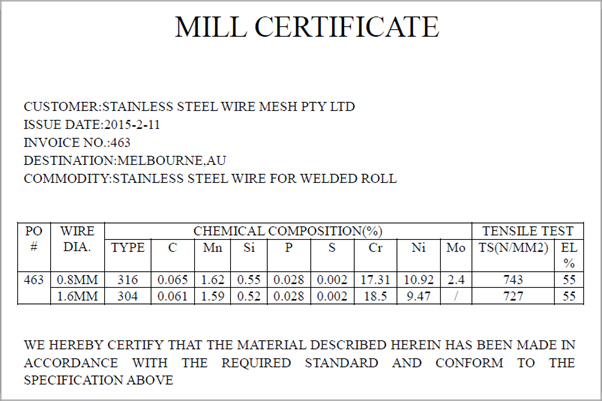 We can also supply a Test Certificate for your stainless steel wire and mesh, when required. 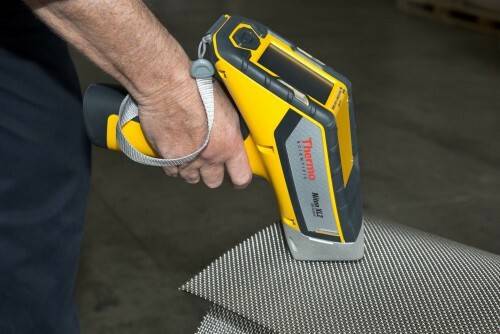 Analysing stainless steel wire mesh with Niton XL2 analyser- if grade 304 or 316? For example, magnetic testing, spark testing and hardness testing can distinguish between certain grades of stainless steel. They cannot however, distinguish between 304 and 316 grades because both are non-magnetic, produce the same short, reddish sparks, and have similar hardness. Acid testing is one test that will separate 304 and 316 grades of stainless steel. Hydrochloric acid attacks 304 grade very rapidly and produces gas, but attacks 316 grade only very slowly. There are also proprietary test chemicals, such as Decapoli and Avesta 960 which detect the presence of molybdenum, a component of 316 grade, but not of 304 grade.